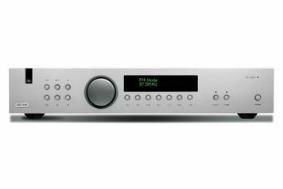 BRISTOL SHOW: Arcam to launch FMJ T32 DAB+/FM tuner | What Hi-Fi? They'll be in the dealers later this month to coincide with the model's UK launch at the Bristol Sound & Vision Show, running from February 20-22. The T32 adds DAB+ compatibility for use with future broadcasts, a standard DAB tuner with band III and L-band reception, FM/AM tuner, plus an advanced iPod interface designed to work with Arcam's rDock and rLead, which brings full iPod remote control to any separates hi-fi system. For DAB reception, the T32 uses the Wolfson 8740 DAC from Arcam's DVD players for digital-to-analogue conversion, while all circuitry is fed from a toroidal power transformer and multiple DC power supplies, with components mounted on double-sided fibreglass PCBs (printed circuit boards). Other features include a large VFD display, full IR/RS232 controls for custom installation (including downloadable Crestron and AMX modules), and two pairs of RCA outputs for multiroom use or direct recording. The Arcam FMJ T32 is available in silver or black for £550.